What are grassburs and how do you prevent them from invading your lawn? Now is the time to apply pre-emergent herbicide every 6 weeks through the end of September. 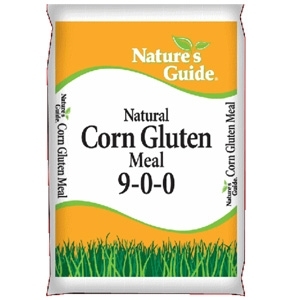 We offer a variety of treatments, such as Corn Gluten Meal (organic) and Weed & Feed at Mansfield Feed. Our trained sales staff can help you choose the best product for your specific application. Read more below on how to apply pre-emergent herbicide to your lawn. 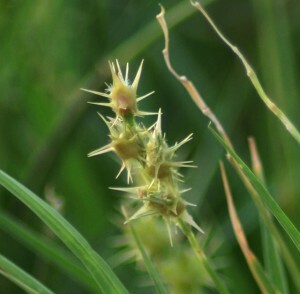 Field sandburs (grassburs) are generally not a problem in well maintained turfgrass areas. With proper fertilization, mowing and irrigation, you can produce a turf that is dense enough to prevent sandbur (grassbur)s from becoming a problem. However, if field sandburs (grassburs) do become a problem there are several effective herbicides that can be used to control this particular weed. The most effective and efficient method of control is to use a pre-emergent herbicide. To be effective, these pre emergents need to be applied before weed seeds germinate — generally when the soil temperature (NOT the air temperature) reaches 52 degrees F. This usually occurs by March 15 in the central Texas area. In north Texas areas, apply the pre-emergent by April 1 and in southern areas of the state by March 1. Note: in south Texas and even in central Texas during mild winters the field sandbur plants will survive and act like a perennial weed. In these cases, a pre-emergent herbicide will not be effective in controlling these particular plants, but will work on any of the seeds that try to germinate. If a post-emergence herbicide such as MSMA or DSMA is used, wait until the day time temperatures are about 75 degrees F. for the products to be most effective. To insure complete control of germinating grass burrs in heavily infested areas, extend the residual of the herbicide barrier in the soil and thus extend the length of control period by making applications of the pre-emergent herbicide EVERY 6 WEEKS through September. In areas with a light infestation of grass burrs, two applications that are 6 weeks apart and after the initial application should control seed germination. As always, the pre-emergent application needs to be watered in thoroughly. Not applying enough water after application of a pre-emergent herbicide is one of the main reason for failure to effectively obtain control of the annual grassy weeds such as sandburs (grassburs). REMEMBER: A dense stand of healthy grass provides the best weed control. Because most weeds are “opportunists” that invade weakened lawns, the fight against weeds starts with good management. All cultural practices such as mowing, fertilizing and watering should be done in a manner and time that will favor the grass rather than the weeds. Height of mowing influences competition against weeds such as crabgrass – the higher the cut, the lower the infestation. Frequent light sprinkling encourages shallow-rooted weeds and seed germination. Less frequent “deep-soak” watering that maintains a dry surface layer provides the grass with a competitive advantage. Fertilizer-herbicide combinations are extremely popular because they combine two operations. Combinations with pre-emergence chemicals are generally effective since both the fertilizer and herbicide action are dependent on contact with the soil. Post-emergence herbicide action depends more on absorption by leaves, and granules in such combinations do not adhere well to smooth-surfaced leaves. They will stick better if applied when weed leaves are damp. “Weed and feed” materials present a conflict in desirable actions. Proper time for weed control often does not coincide with the most desirable time and rates for fertilizing. If used for follow-up fertilizations, there is danger of herbicide overdose. This entry was posted on Friday, August 31st, 2012 at 4:24 pm	and is filed under Garden. You can follow any responses to this entry through the RSS 2.0 feed. Both comments and pings are currently closed.